Are you afraid of Islam? Reserve the date! Whatever you celebrate, come celebrate with us. 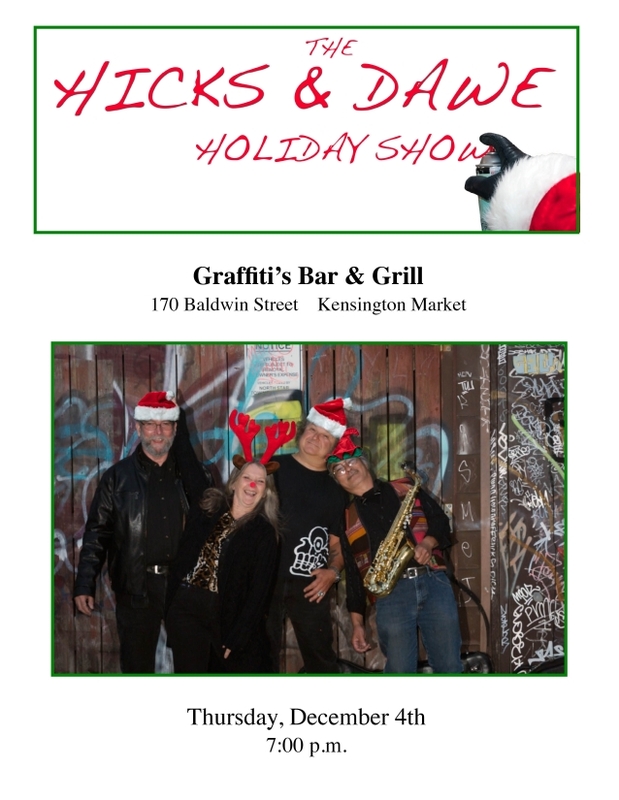 It’s the 3rd annual H&D Holiday Party at Graffiti’s. We’ll be decorating the place (that alone you should see), and once again having a number of cool door prizes including, yes, some handmade organic Chocolate Jesuses (Jesi?) from COCO. We’ll be playing three sets, but probably shorter ones so we can chat and catch up with everyone. We want to party, too! So if you haven’t been out in a while, this is the one to come to. As usual – no cover. Doc on guitar, me on banjos, and Neil on sax and bass. March 26th – 7 – 10 PM – be there or be square. We’ve cracked the icicles off our ears, put away the snowshoes, and we’re really going to put some spring in our steps. To celebrate, we’re doing something we’ve never done before, including a bunch of tunes we’ve either never played, or not in some years (and never the way we’re doing them this time). Shorter sets, so more time for gabbing, too. Be buckets of fun. Come and help us enjoy the balmy breezes in Kensington Market on a Thursday evening. And the fine libations at Graffiti’s. Early start so lots of time to get home and rest up for Friday. One show only – no cover – just party. Make us your spring wakeup. As usual, we will be joined by the Earl of Bassax hisself, Neil Kitagawa. I have been asked again to host the Yor Magic Open Mic at the Magic Oven on Keele in The Junction on Saturday, March 7th, from 2 – 6PM. This has turned into quite the event, with more people trying to sign up than we have time for and more people gathering to listen than we have chairs for. This week I’ll be accompanied by my good buddy Neil Kitagawa on bass and sax for my small opening bit, and possibly some guitar playing friends for a bit of a jam. After that – we’ve has so many talented performers – musicians, comics, poets, storytellers … I expect it will be quite the afternoon. There we were, at Graffiti’s Bar & Grill, with my GoPro on a tripod, to see if we could get anything decent off the floor. A cold, dismal, snowy January 29th, 2015 it was. We’ve had way bigger crowds, but we’ve also had smaller. But just the right size for some recording without a stream of people in and out the door behind us. As it happens, the gear worked. We’ll figure out how to make it better as we go along, but for now, here it be. I’ll be posting more from this night in the weeks to come as I get the time to edit them. This tune was written by me in 2001/2 after a delightful trip to Newfoundland. Enjoy! Monday the 16th, after lazing about for the long weekend, you’re going to want a drink. And I know just where you can get one. And some music to wash away those Monday blues. 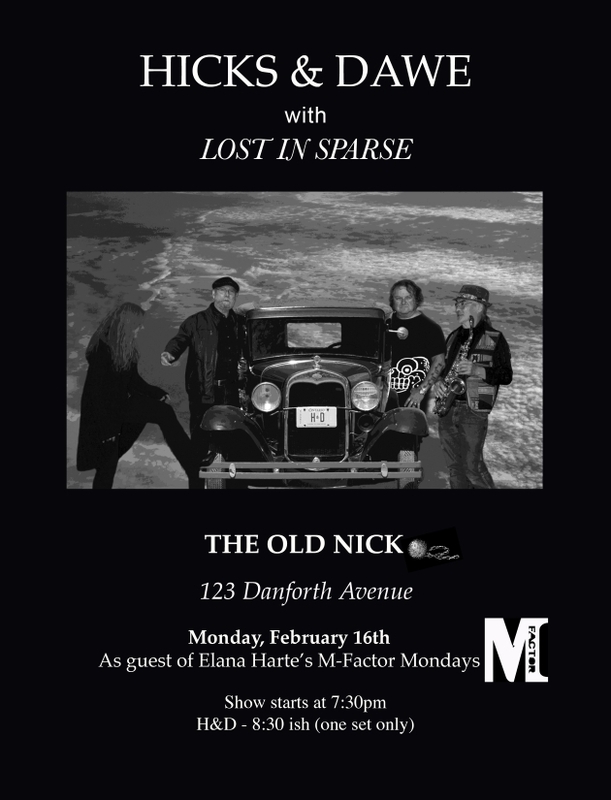 The Old Nick on The Danforth, that’s where. Elana Harte has invited us back again to be part of M Factor Mondays, this time with Elana herself kicking it off, of course, followed by the talented Kim Koren and us with sets of our own. The show starts at 7:30. Steps from the subway, so easy to get to and back from. Another unique lineup of tunes from us, and again we’ll be joined by Neil Kitagawa andMarthalee Aykroyd. OK – it’s on. We’ve got the raffle tickets (free! ), and some of the decorations. We’ve got a setlist. Neil has broken out the baritone sax and a pennywhistle. Martha has broken out in harmonies. We’ve got at least 4 seasonal tunes folded in to the mix, but not ones you hear regularly, if at all. Me on banjos, Doc on guitar, Neil Kitagawa and Martha Aykroyd as Lost in Sparse with horns, bass and percussion. ‘Twas a barrel of fun last year, and will be again. Hope you can make it. Bill Rickard and I have been friends for some years. We share a love of banjos, most banjo music, and motorcycles. For those who don’t know, Bill makes some of the most amazing banjos around these days. But not only that, he has become a major supplier of banjo parts to the industry. Find him at Rickard Banjos. He has a shop in Aurora, Ontario, about 40 minutes from my basement. He is an accomplished machinist, and is reproducing many vintage style parts from the first Golden Age of the 5-string banjo (~1880 to ~1910). And not just reproducing them, but making them from better materials, and using modern machining methods to make them even stronger. If you’ve seen me play, I likely had my go-to banjo, the Ghastlytone, Bill made all the metal parts and collaborated with Hugh Hunter at Midnight Special on some of the woodworking. Bill’s new tuners at 1 and 3, and Bill Keith‘s at 2 and 4 so I can get from doubleD tuning to A or A-sawmill in a hurry. The peghead inlay is my concept, and Bill’s magic construction. How it ended up is a black pearl cloud with a white pearl edge (how Bill cut this I have no idea! 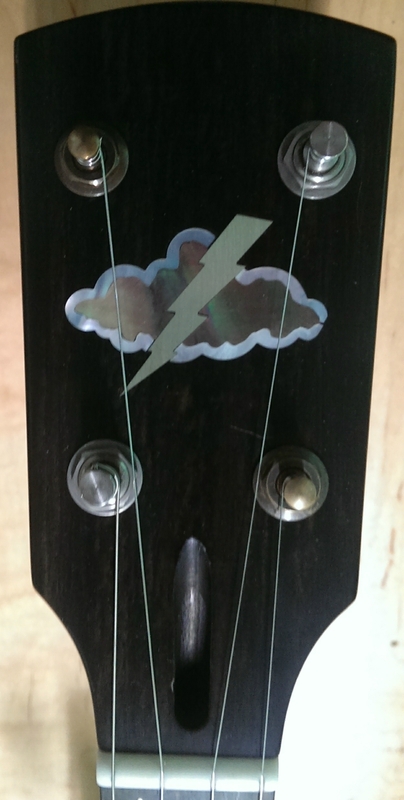 ), with a german-silver thunderbolt through it on an ebony back over the cocobolo neck. It throws off dark rainbows in the light. The neck adjustment access is uncovered, and painted black so it blends in. 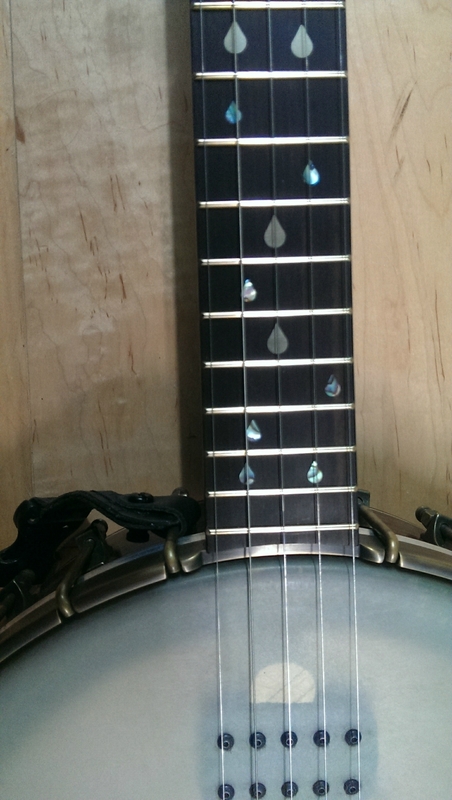 The inlays on the neck are raindrops, seemingly randomly scattered down the neck. The actual placement is my design, and Bill and I had many discussions (arguments? angst?) about what materials would be best until we decided on german-silver for the big drops at the standard position markers (1,3,5,7,10,12, 17 and 19) and bluish abalone for the rest. The pictures don’t do it justice. The neck itself is made of cocobolo, one piece cut in half and joined on the middle with a maple/ebony/maple strip. The fingerboard is ebony, unbound, with 21 stainless steel frets. Scale length is 26-1/2 inches, one of the old Vega standards. It is only 21 frets so I could get the bridge closer to the edge of the pot than Bill normally puts them. There is no frailing scoop. There are railroad spike capos in the neck at 6, 7, and 8, so I can mess about with key changes and modal tunings with less fuss on stage. I am a fingerstyle player who plays to the end of the neck, so I need low action (1/8th at 15). The action also needs to be low so the strings are close enough to the humbucker pickup, supplied by John Kavanaugh, to get decent amplification. I tried to get the height the same as the Ghastlytone, so I would have less fussing about when dealing with DI boxes and PA systems at gigs. The closer they are to each other – the better. The pot is also beautifully figured cocobolo, with antiqued brass metal to hold the head down. It’s a 12″ pot, of course, so I can get some decent low-end. Bill was insistent on a 1/2″ pot, while I was worried that anything less than 5/8 or even 3/4 wasn’t going to have enough punch. Bill was right, and I was not. It is a LOUD banjo. 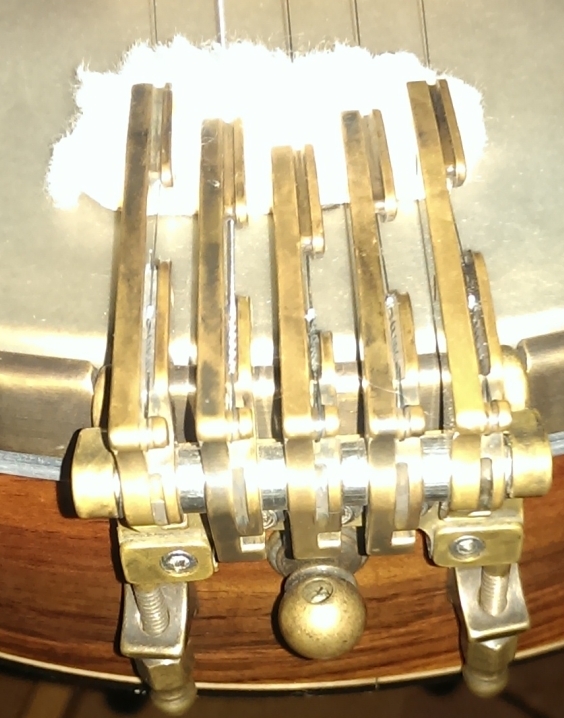 The Dobson tone ring really rings in this configuration. It is so loud that the rich overtones collide with each other when I’m playing jazzier chords at speed. So I had to put some wool between the tailpiece and the head to kill the noise from the strings past the bridge, and a piece of cork on the perch pole just barely touching the head near the pickup. Now it’s perfect. And very similar to the Ghastlytone. Now I can’t tell which is better, as they’re both better than anything else modern I’ve heard for the way I play. 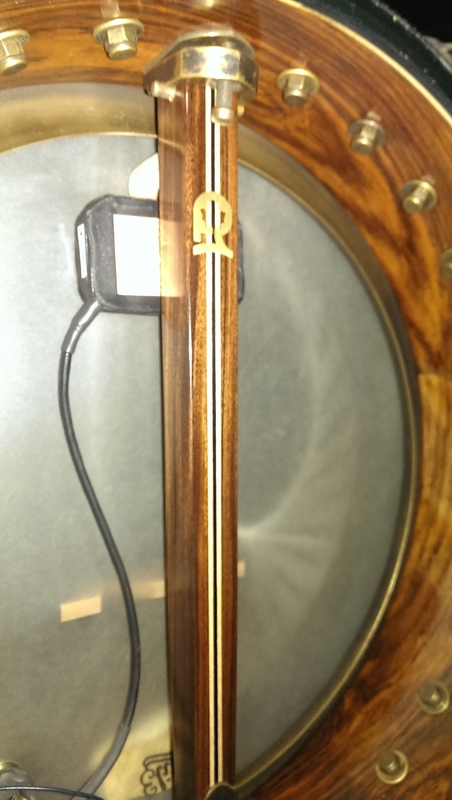 So – 1/2″ cocobolo rim with a Dobson ring sounds reasonably close to a 3/4″ hard maple rim with a tubaphone. Weird, but I couldn’t be happier. I now have two go-to axes. One is tuned in D and one in C anyway, so I don’t have to retune on stage between tunes. They will both be going with me to every gig. And the tailpiece. Sometimes I wonder if Bill is a mad genius, sometimes I’m certain. This massive piece of high tolerance engineering is a true wonder. Bill has taken the Oettinger idea from the Jazz Age and brought it to the space age. Steel allen screws into the brass ensure precise calibration of every arm, so string tension can be balanced for even tone and volume across all the strings. And the overall height is just as easily adjusted as the piece clamps to the rim hooks. For a hot rodder like me – this is a joy. Hours of fiddling to get it the way I want, then I can change my mind and do it all over. So – Bill – this is an amazing instrument. Well worth all of the time and effort it we’ve put into it over however many months (years?) it has taken.